I have always loved crafts, ever since I was a kid. But now that I have my own kid to do crafts with, I’m conscious of how wasteful, toxic, or un-green crafts can sometimes be. Healthy Child has a great infographic about what to look for in arts & crafts supplies to avoid exposing your child to toxins. Thankfully, there ARE eco-friendly and toxin-free options! 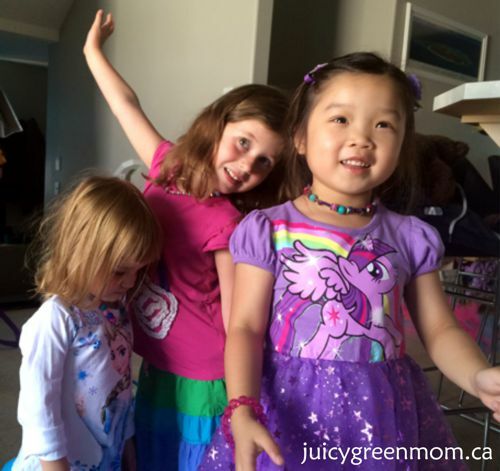 AnnyMay is a Canadian supplier of eco-friendly and natural craft supplies on Etsy. I purchased wood buttons from Anny before for my daughter’s big-girl bed, as well as wool felt balls to use in lieu of traditional pom poms. I was really excited when Anny offered to send me some supplies for my daughter and her friends to use to make something special. We decided to make some wooden bead and wool felt ball necklaces that could also be used as diffuser necklaces (a drop of essential oil on a wool felt ball is all it takes!). The adults helped the girls thread the beads and wool felt balls onto the thread (the wool felt balls are easy to get through with an embroidery needle). We used the flower bead caps to go around some of the wool felt balls. We then tied off both ends when we got the front ⅔ of the necklace done, and then tied the ends to ribbon. 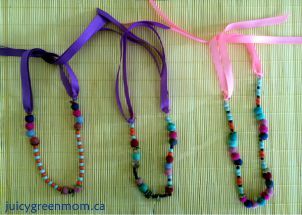 The ribbon ends then became the tying clasp for the necklaces for a little extra pizzazz. The girls were excited to choose what essential oil they wanted to put onto a few of the wool balls, and wear the necklaces! We still had lots left over after the necklaces were finished – so we can make matching bracelets too! The girls loved the different colours they could choose from, and the little heart charms added an extra special touch. I am so happy with the beautiful quality of these supplies, and can rest easy knowing that they are completely safe for our kids to wear as much as they want! AnnyMay is giving one lucky winner the opportunity to unleash your creativity with a $25 gift card! Giveaway open to residents of Canada and the USA only. What would you make with AnnyMay’s eco friendly craft supplies? my girl is all about making pretty things these days…..would love to make some matching bracelts! So happy to feature your beautiful supplies, Anny! I would use the wooden beads to make a bracket for my daughter to wear or I’d use the wool pompoms for sorting activities. I would love to make some cute bracelets.